VeloToze Tall Shoe Covers are designed for when the weather takes a turn for the worst. These overshoes are waterproof, windproof and extremely lightweight, they also fit very close around your shoe, making them a very good aerodynamic option. 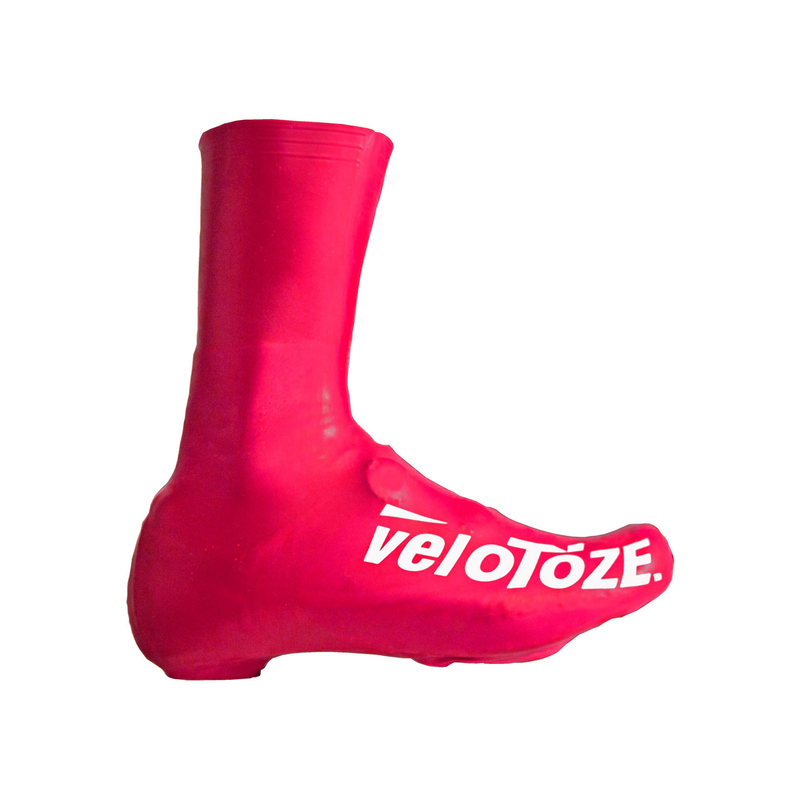 Do not store in direct sunlight VeloToze Toe covers are designed for road cycling on cool, foggy days. Whether it’s race day, training day or just another commute day, VeloToze Toe covers will keep your feet comfortable. Follow the instructions and there's no reason these shouldn't last a whole season. Last pair I still have and now use in training if it is damp and just bought a new pair for this season. They give good waterproof-ness and can keep your feet surprisingly warm. Bought these for racing, excellent fit and I presume they are helping me slip through the air like a slippery eel. Suited for rainy weather. Be very careful when putting them on (they seem to rip pretty easy. A nice pair of overshoes, waterproof but not breathable; good for some racing during the late winter/early spring. Use these for TT. Put some baby powder in between uses to keep it from sticking and to facilitate sliding them over your feet. I wanna be prepared for all kinds of weather on my daily commute. I`ve never had overshoes that kept my shoes dry, so I hope these will do the trick. It takes some time and practice to put them on, because they are very sticky. One had a L on the side. Don`t know if that is supposed to be the left one, because they both are identical. They seem to pair extremely well with Speedplay zero cleats. Little scary to put them on but not rocket science. Great addition for a TT setup! Resistant, waterproof and really efficient. From start to finish, I had no problems, great! Once the knack of putting them on is mastered they are comfortable, keep feet dry and warm. Not open sole so road shoes only but means they are watertight. Time will tell as to robustness but highly recommended. Great product, material is more durable than I thought it would be. Very difficult to get on and off. I am. Size 43 and the large / xl are too big when on the shoe. Can be a little awkward to get on and off and your feet do get quite sweaty, but keeps your shoes clean and dry. The only wetness in my foot is my sweat. Well done. Bought these to stop my feet getting soaked when there is a down pour and they do work. Nice and light but take care when putting them on. Great to wear when wet out. Lightweight and provides nice protection from rain. My new standard in foul weather, learned to get them on and off easily, storing them with socks inside so they don't "stick" to itself. Damage easily on buckles and walking on rough roads, but still love them. Keep my feet bone dry. Not the most durable product, but effective. Great product for rainy days no more water draining through the top of the shoe covers. Needs careful handling but perfect for the job. Super overshoe the only one out there that is up to wet weather. I would highly recommend these!! Great value and really waterproof. Great aero overshoe, cheap compared top most other brands. There is an art to getting them on. After a few rides adding talc to the rubber helps getting them on. Also keep your feet dry when its raining. Nice aero fit . Race day only... and defo no walking around in them, for any length of time. After the second outing they have a couple of small holes around the toe, I only hook them over the shoe just before I'm about to head to the start. Excellent product. My feet stayed dry in heavy rain, and warm too.